The Receipt is an official accounting document which represents any kind of payment that was received from the buyer in exchange for any provided goods / services: Cash, Credit Card, Cheque, and Bank Transfer. For financial companies, Hyper offers to receive an Assignments of rights and promissory notes according to the Taxes authority and the money laundering prevention regulations. According to the regulation and law, Receipt should be produced for every received payment. This is an official document that represents the payment that were received by the organization for any sold goods or services. Taxes payment (such as VAT and Income tax) should be done according to Tax Invoice production and not due to Receipt production. Each receipt gets unique serial number in the Hyper system and creates a bookkeeping entry in the Client Account Journal. The system allows to create and produce new receipt or load previous document to print certified copy or for cancellation purpose. The system allows to produce the Receipt document for a single or multiple Tax Invoices and also for any received payment. Receipt production is also available when producing Tax Invoice (producing Tax Invoice Receipt). Please note - a receipt can be produced only when the total payment amount equals or higher than the value of "Receipt Collection Target" (an optional field). When choosing the Receipt label, this area background will be differently colored and will contain fields and action buttons according to the users activity. 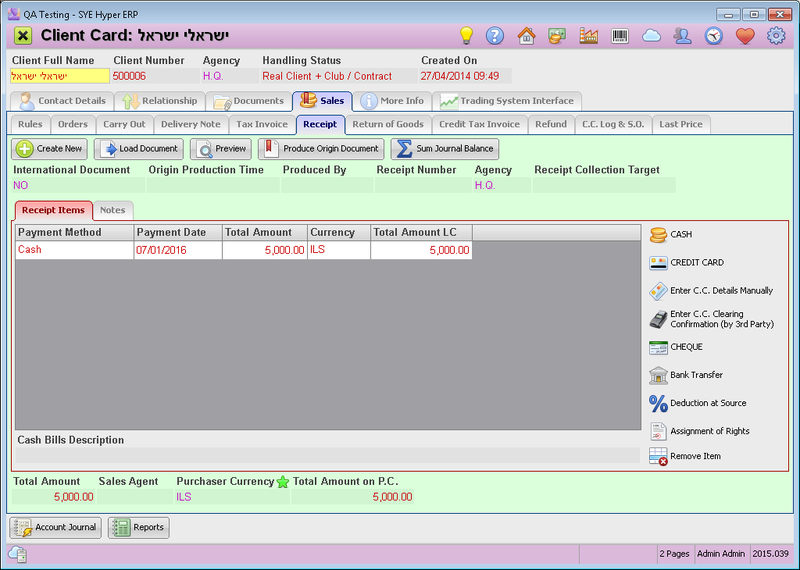 In the center of the screen, the invoice items table presents the items, services and notes related to this invoice. The table also presents additional information about the items and services, descriptions, quantities and prices. 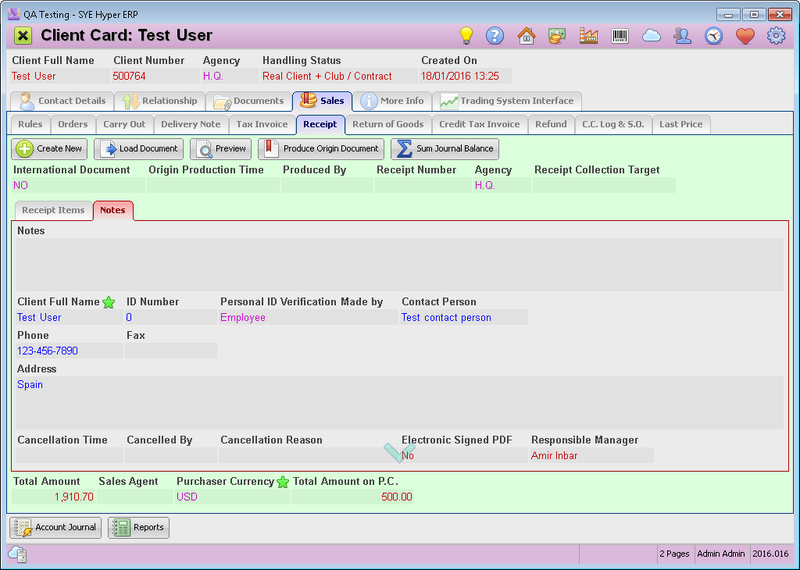 At the top of this screen there are definition fields and in the center of the screen the Receipt Items and Notes will be presented as described below. Create a new Receipt document. For further information, lease see the next section. Load Document - Load a produced Receipt. For further information, please click here. Few action buttons are available in this screen and will be described below. Press the Create New button. Fill in the definition fields, as described at the next section. Choosing the payment method by using the buttons at the right side of the screen. Fill in the required details according to the chosen payment method. Fill in the relevant details and information in the "Notes" label. Press the Produce Origin Document and confirm the preview. Print the document and sign it according to the organization's regulations. Receipt Collection Target Defines the amount to collect for the receipt. A receipt can be produced only when the total payment amount equals or higher than the value of this field. The value of this field can be manually filled. Alternatively, use the Sum Journal Balance button to fill in this field with the clients balance, in order to get payment for the client whole debt. In the center of this screen, the receipt items and the payment methods are presented as described below. Cash Receive a cash payment from the client. Credit Card Receive a credit card payment, by using the MSR device, if Hyper is connected to credit card clearing service. This option is also used for Standing Orders for Auto Billing (in that case, the system uses the first credit card in the list, as default). Enter C.C. Details Manually Credit card payment, when its details are manually entered to the system. This option is available if Hyper is connected to credit card clearing service. cheque Receive a cheque payment from the client. Bank Transfer Payment is received via bank transfer. This receipt should be produced only after receiving the payment. After updating all off the required payments for the Invoice, the user can add remarks and notifications that will be printed on the original document. In this area, the user can add any relevant information. Also, the user can edit the client personal details (for this document only). In the "Internal Notes" field, the user can write any note for internal use only. The internal notes will not be printed on the document. Please note - the "Personal ID Verification Made by" and "Contact Person" fields, are defined for regulation purpose and are displayed after regulatory implementation of the system. The system supports a multi currency payback and calculates the required payback for receiving payment in foreign currency. At first, the system prefers to payback in the local currency, and in case of foreign currency overpayment, it calculates and displays the payback in the local currency. By using this option, the user can produce a certified copy of produced Receipts. The system will add the title "Certified Copy" at the top of the document. Also, according to the definitions in the client card ("Send Official Documents to Primary Email" field), a digital copy can be sent to the client. Previous / Next Record buttons, allows the user to browse through the records of the produced Receipts. The system allows to cancel a Receipt document, as discussed in the section of Cancel / Retrieve Document. Retrieve a canceled Receipt document, as discussed in the section of Cancel / Retrieve Document. After updating the Receipt details, it can be produced. The user can use the Preview button to verify the relevant details. To produce the Receipt Original document, press the Produce Origin Document button. The Receipt document includes the personal details of the client and the user as well as the orders and the items details, Selling Price and Currency and Total Charge. At the top of the document there is the Tax Invoice number. In the "Notes" label, you can find the Cancellation time, Cancellation Reason and the name of the user that made the cancellation. Please note - After canceling a receipt document, the system will automatically mark its bookkeeping entry as canceled. There are three options for the user interface of receiving Cash: Bills table / Bills table and Free Field / Bills Skin. The user can choose his favorite UI in the Bookkeeping Label of the of the System Fundamentals, using the "Receipt / Refund Cash UI" field options. Using the "Duty Fields for Original Sales Document" field, in the Bookkeeping label, the user can define mandatory information fields required to produce a Receipt. Using the "Print # Copies for every Original Receipt" field, in the Bookkeeping label, the user can define how many copies will be automatically printed for every original Receipt. Using the "Number Receipts From" field, in the Bookkeeping label, the user can define the first Receipt Number. The receipts numbering will start from this number. In the Agencies Label of the System Fundamentals, the user can define "Default Notes for Local Receipt Form", that will be printed on the Receipt document.